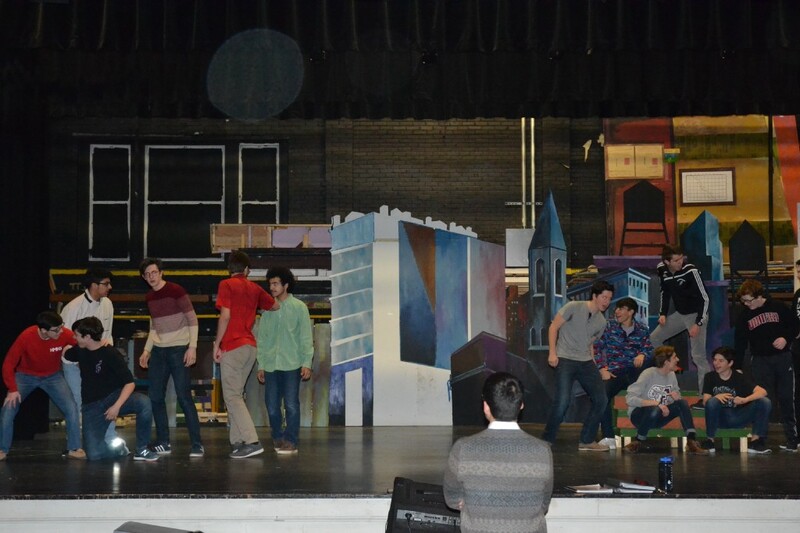 Members of the rival gangs Sharks (left) and Jets (right) rehearsing a scene from the upcoming Haddonfield Memorial High School production of “West Side Story,” while director Matt DiDonato (center) looks on, during the Sun’s visit on Feb. 14. Long before the National Hockey League brought together two of its franchises for clashes on ice, New York City gangs called the Jets and Sharks battled for control of turf in the concrete jungle of Manhattan. Featuring a cast, crew, and orchestra of 80 students, Haddonfield Memorial High School’s upcoming production of “West Side Story” is one of the most enduring examples of a musical that tackles serious issues — in this case race relations between the children of established white European residents and recent immigrants from Puerto Rico. In this urban adaptation of “Romeo and Juliet” which first hit the stage in 1957 before becoming a hit movie four years later, Shakespeare’s star-crossed lovers are reimagined as Tony and Maria — two teenagers in the Upper West Side during the late 1950s. The feuding Montagues and Capulets are replaced with teenage street gangs and the mercurial worlds they inhabit. Everyone involved with the production has worked hard to research the history and explore the social implications of the work in addition to preparing the scenes, music, and dances. Vaughn said the key to making this particular version relevant and real, is that all of the Sharks are being trained to emulate accents as closely as possible. When The Sun attended rehearsals on Feb. 14, actors who portrayed both the Jets and the Sharks were moving right along, with the only interruptions in acting out their scenes due to minor technical adjustments from DiDonato. It was clear they’ve been together long enough to not only bond within their own groups, but also to carefully memorize each step and note and lyric throughout various set pieces. Rehearsals have been ongoing since the previous summer, but picked up in intensity once school resumed from holiday break in January. “What you’re seeing now is something they’ve (the Jets) done maybe once or twice before. They’re just cleaning it up a bit and getting things set. We’re getting close to tech week and close to setting everything up, so we are finishing things we haven’t covered before and polishing it all up,” Vaughn said. 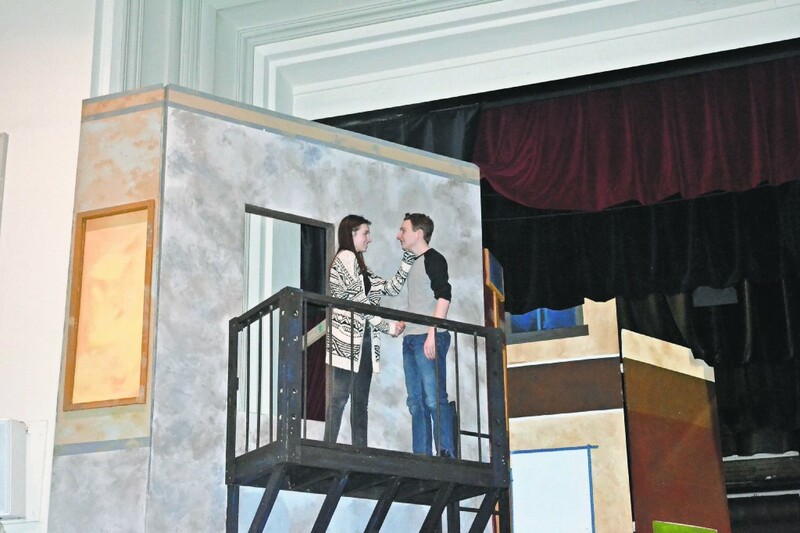 HMHS sophomore Anna Forebaugh (left) and junior Will Tully (right) star in “West Side Story” as star-crossed lovers Maria and Tony. They rehearsed an intimate and crucial scene in the musical on Feb. 14. Sophomore Anna Forebaugh and junior Will Tully play the main romantic leads, Maria and Tony. They did not really know each other outside of the drama club and last year’s musical, “Sister Act,” since their age difference precluded them having the same classes together. However, they both said chemistry between them was not hard to find and build on. Aside from romantic and ethnic entanglements, another primary theme to the musical is wishing for a better place, a better time and better things in life. Performances of “West Side Story” are set for March 8, 9, 15, and 16 at 7:30 p.m. and March 10 at 2 p.m. Tickets cost $12 with a discounted rate of $10 for students and seniors. Tickets may be purchased at the door or in advance in the main office during school hours.